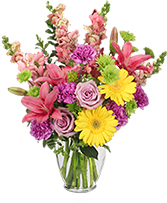 Send smiles all-year long with this bright and cheerful arrangement. Perfect for every occasion - Birthday, Anniversary, Just Because, Congratulations! 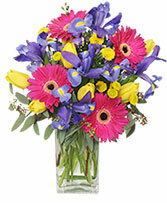 Order by 2pm and Vicky's Floral Design will deliver your fresh floral arrangement today! Perfect for all occasions! This bouquet brings happiness and joy to everyone's day. One of our Best Sellers - send farm-fresh florals from Vicky's Floral Design located in the Carlsbad Flower Market today! We deliver Monday-Friday and offer same day delivery if your order is placed online before 2pm Pacific.